mobile internet sms technology text messaging whatsapp The sudden demise of SMS Text messaging? Did you expect this? The sudden demise of SMS Text messaging? Did you expect this? Ab initio, communication serves as a medium of connection. Man made technology and technology gave birth to many exciting things that only facilitated and helped him. The Internet and electronic gadgets didn't make an early entry in the Indian market. Most of the outstanding and exciting technological inventions in the form of application software and programs made much fuss in the western countries like the United States, European Union and some of them in Japan, China, and Korea where companies like Fujifilm, Nokia, Samsung, Apple sowed new seeds and reaped great success. India was the late entrant in this field. With the advancement of technology and internet in the early 2000's in India, mobile technology gained an impetus and thus, we saw Mobile players like Nokia, Motorola, and Samsung entering India. Nokia dominated the Indian market, thus creating a strong base among users who were fond of mobile phones that provided basic functionalities such as calls and SMS text messaging. Cellular calls and SMS text messaging indeed was a boon to the Indian market and its customers. Telecom players like Airtel, Vodafone, Idea, Reliance and others competed with each other, eventually slashing calls rates and SMS rates so as to attract new customers and retaining existing customers. The one who failed to do so saw their customers migrating to other mobile providers. Today we would be talking about the SMS text messaging feature that once ruled the world. I remember how I and few of my friends used to talk via text messages especially during the night during the late 2000's and the early 2010s. That was a good way to connect with friends. Not just friends, everyone used to send SMS greetings during festive seasons and it served as a channel for communication. This was much before the days of Instant Messaging where mobile applications like Whatsapp, Line, Facebook Messenger, Hike etc didn't debut. I remember talking to my friends Harnett and Sarah through text messages. There used to be a hi, hello message every morning and reading messages from our loved ones would drag a smile on our face. Telecom companies were testing the 3G services then and at that phase the call rates were high and internet packs cost bombs. So naturally customers preferred recharging their mobile phones with SMS packs. Initially , the SMS pack used to cost more but telecom companies played smart as they came to know about the demands of mobile internet. But they even knew that it was expensive. At the same time, they had to retain their SMS service users. 10000 SMS's that once used to cost Rs 200 or 150 were provided for Rs 50. That was a smart idea but eventually as 3G and 4G came into the picture , the entire scenario changed . This was a crucial phase of Mobile Internet in India. It was 2011 and with the entry of Instant messaging applications, there was a unique trend observed with Users migrating to Whatsapp. Whatsapp could be seen as a key factor for the sudden demise of SMS text messaging. I could say this from my personal experience. Those were the young days of work and Internet packs used to cost around Rs. 400 and 10000 SMS message packs used to cost Rs. 50. But as the telecom giants kept on slashing the data rates, customers like me gained benefits eventually leading to the death of text messaging. It was observed that in 2010, an Indian send an average of 75 SMS per day that got reduced to 10 in 2014 and as per the latest news, it has got reduced to 2. I highly doubt in the due course, mobile phones would discontinue the SMS text messaging feature. But the chances seem slim. 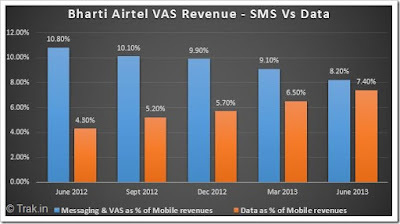 Airtel faced the heat when it failed to retain its SMS user but at the same time, a good hike in the number of Internet users proved good for them. Same is the case for Idea Cellular and Vodafone. The emergence of the internet and instant messaging apps have proved to be a great threat to the telecom companies as most users are found to use the call features available on the messengers instead of the mobile phone network. Thus, the revenue generated from these sources have reduced drastically. The Telecom companies are now facing the heat. It is predicted that SMS users will fall drastically in the upcoming days and even voice call will face the heat. Telecom companies will have to play smart and try something new in order to survive. Survival of the fittest is the need of the hour. These days my phone inbox is filled with spam messages and promotional text messages, nothing fruitful. Text messaging once ruled the world but I am afraid that the scenario has changed now. Tell me about your experience with text messaging. Did you belong to the species of people who got message packs activated every month? How text messages do you used to send every day? What's your views about this sudden death of SMS text messaging? 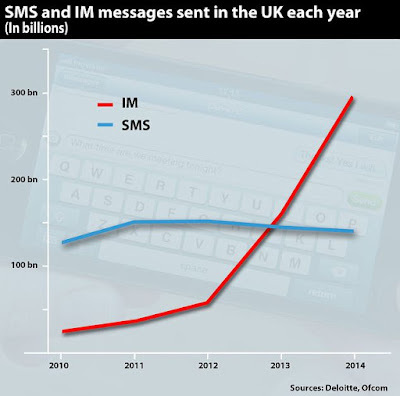 Is it the war between SMS vs Instant Messaging? I don't text. Don't own a cell phone. I do message via computer on FB, Twitter, but not too often. Still I prefer an email to a phone call any day!